There is some life in the garden yet…inch-tall kale and mustard seedlings from seed broadcast over one of our three 4′ x 40′ beds that I tilled under last week; a few tomato vines I took as suckers off the main crop and rooted in water in July; one hill of summer squash planted in early August that probably won’t set fruit; and soon, the turnip seeds I planted just this morning. And yesterday, I cut back the unstoppable champion of this year’s garden and kitchen: swiss chard. We’d let it go for a week without cutting and the leaves I culled yesterday were big as tobacco leaves, the flat celery like stalks 2 inches wide. The cuttings will make great “greens” for the compost pile after I get the machete or lawn mower to it to break it up into microbe-digestible pieces. Pruned back to the ground, it will grow back to give us a few more meals yet, and we’ve been using the small leaves like lettuce for sandwiches and salads, its thicker texture and flavor more like that of spinach. We’re not sure how we’ll change the mix of seeds we plant in next year’s garden, but Lucillus Swiss Chard will certainly be among them. Oh, and HAPPY BIRTHDAY, TARYN! My swiss chard is still going strong too and I let my arugula go to seed. It dropped seed all over and now I have a carpet of new arugula growing. Still going out to the garden to harvest my supper. I’ve been turning under various successions of green beans, squash, cukes and herbs, as they play out, and planting bed after bed of spinach and kale, which I hope will provide green leafies this fall, winter over, and also produce next spring, like last year. I had forgotten what a good producer swiss chard is, and need to plant some of that too. I’m hoping the kale won’t be attacked by those little gooey blobs of bugs that sucked the life out of them last year. As an organic gardener, I don’t mind using BT on the cabbage loopers, but found it didn’t work on the blobs, which I suspect might be aphids. Has anyone else encountered such monsters, and, if so, is there anything that can be done about them that doesn’t involve chemicals? 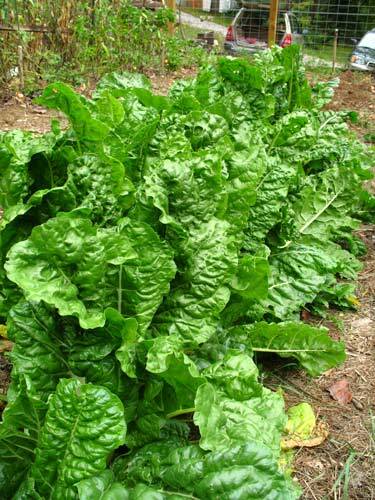 Love swiss chard; do try the multi-color sc which is mild and tasty, plus gorgeous to grow. I used to border my flower bed with it, against the low rock wall. Now I grow it in a big pot, taking it into the sunporch so it can go on producing all winter long. Cut it in ribbons, braise in a bit of olive oil, add some balsamic vinegar and a little chopped or dried garlic. Fred, My chard has also done well even in our baking dry summer heat — it’s really my champion, though I’ve done well with tomatoes and beans too. Am trying to be a bit more ambitious this fall with crucifers and my brussels sprouts are already tall (have to watch the critters that love to eat them). Broccoli and kohlrabi are already sprouting; I may have left them a tad late. Next Next post: Enjoy The View: More Notecards Coming!